Secure Data Technologies is proud to partner with ExaGrid, to help you find the perfect stress-free backup & storage solutions for your growing business needs in the St Louis area. ExaGrid is hyper-converged secondary storage (HCSS) for backup. ExaGrid’s unique landing zone and scale-out architecture provide the fastest backup — resulting in the shortest fixed backup window, the fastest local restores, fastest offsite tape copies and instant VM recoveries while permanently fixing the backup window length, all with reduced cost up front and over time. ExaGrid offers a unique way of implementing deduplication to fundamentally fix the challenges of legacy backup storage. 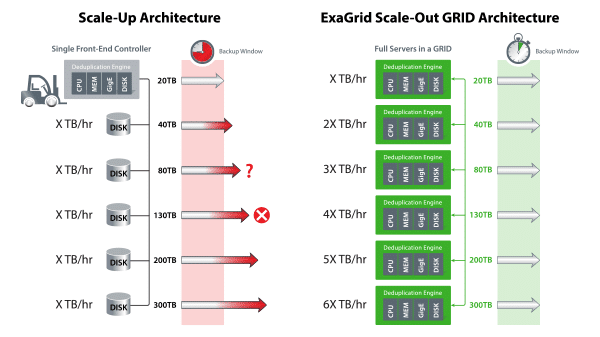 ExaGrid’s hyper-converged secondary storage for backup offers a unique landing zone and scale-out architecture that provide the fastest backups — resulting in the shortest fixed backup window, the fastest local restores, fastest offsite tape copies, and instant VM recoveries while permanently fixing the backup window length, all with reduced cost up front and over time. Other deduplication approaches may save some amount of storage or bandwidth, but fall short on solving the three new compute problems that deduplication creates. ExaGrid takes the stress of backup storage away. 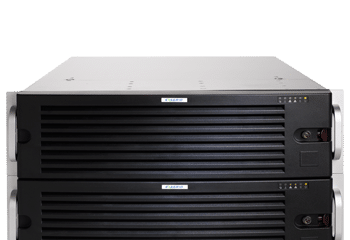 The ExaGrid Backup Appliance is a backup storage solution with data deduplication that works with almost all backup software available. By using a Landing zone of the uncompressed version of the most recent backup ExaGrid and a second layer of older deduplicated backups, ExaGrid minimizes the amount of data stored and the amount of bandwidth for replication for the shortest fixed backup window. As such, the ExaGrid Backup Appliance boasts the fastest local restores, fastest offsite tape copies, and instant VM recoveries, all with reduced cost up front and over time.